Home → News → Congratulations to Library Staff Joyce and Allen! Congratulations to Library Staff Joyce and Allen! Congratulations, and many thanks, to library staff Joyce Zimmerschied and Allen Nguyen, who were honored at the PSU Length of Service Award Celebration and Reception on Thursday, March 5. Photo of Joyce Zimmerschied by Christian Aniciete, University Communications. 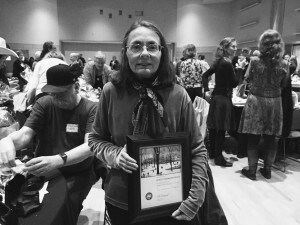 Allen, recognized for 20 years of service to PSU, is the Library’s Course Reserves Coordinator. He makes sure students are able to access the textbooks and other course materials that their instructors place on reserve. So much important work happens behind the scenes in the Library. We are appreciative of all of our employees and especially today thank Joyce and Allen for their many contributions. Congratulations, Joyce and Allen!